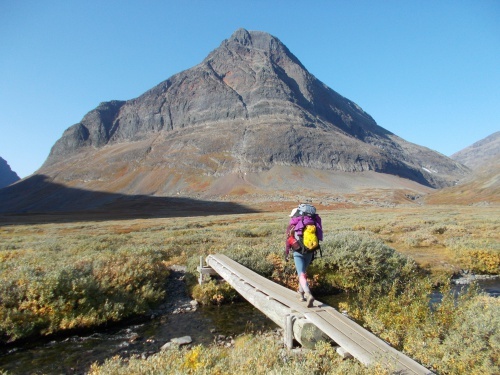 Another Long Walk: Day 25: Back to the Kungsleden! 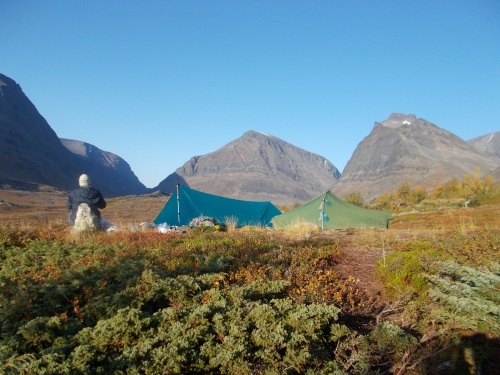 But we lingered in camp fairly late because Karolina was still sore and tired from our summit of Kebnekaise the day before. She slept in late and we didn't leave camp until nearly 10:00 in the morning--among our latest start time of the trail. I didn't mind so much, though. 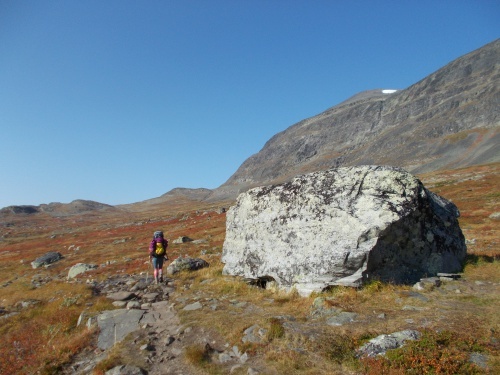 Our goal for today was merely to get back on the Kungsleden less than 10 miles away and the weather forecast called for nice weather the whole day. We were in no rush! I eat breakfast in camp in the morning. What a beautiful day! The day was relatively uneventful. The trail was mostly flat, following the valley bottom back to the trail. I jokingly called it the "Valley of Shade" because surrounded by tall mountains on both sides, almost the entire canyon bottom was cast in shade. 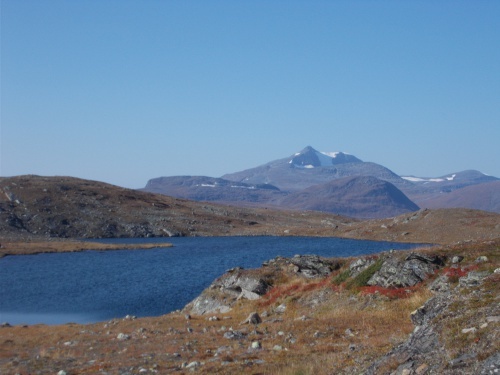 I didn't realize it was such a problem on the way to Kebnekaise because it was mostly cloudy and overcast, but a clear day like today, I definitely noticed it! 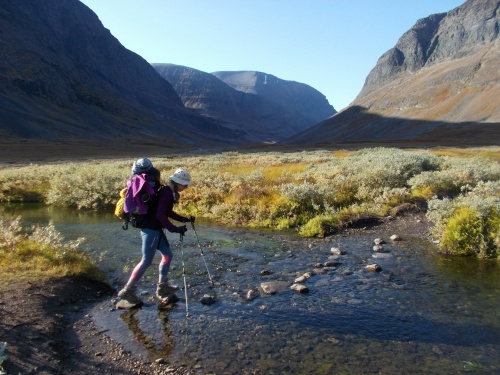 At one location, from the Kungsleden, we spotted what we felt certain was the tippy-top of Kebnekaise through a break in the mountains. "Yep," I pointed to it, "that's where we were about 24 hours ago." 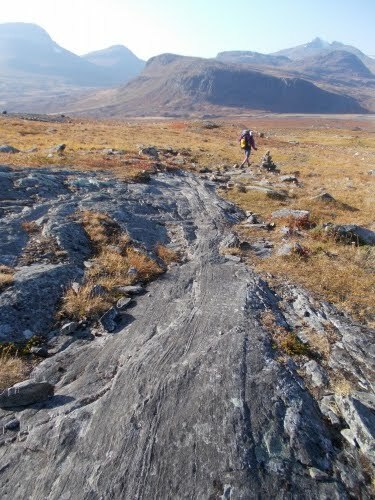 The main side trail (is that possible? A main side trail?) 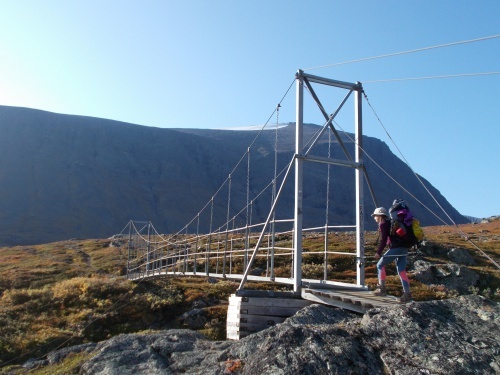 led to the Singi hut where it would reconnect perpendicularly with the Kungsleden Trail. 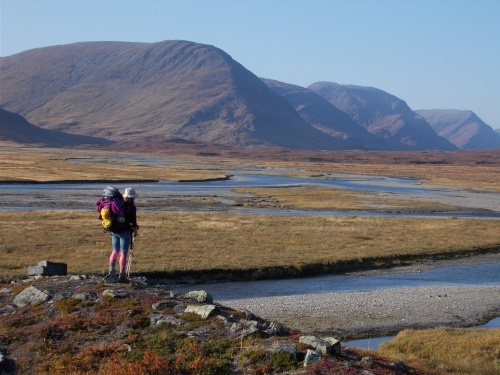 There was nothing at the hut that we wanted or needed, however, and we decided to veer off on a shortcut that connected with the Kungsleden further north and missing the Singi hut. We figured it would cut off a kilometer or two of walking overall. The shortcut also included the one hump of the day, climbing up and over a small ridge that we hoped would provide us some wonderful views--which it did! It was an easy, pleasant day. 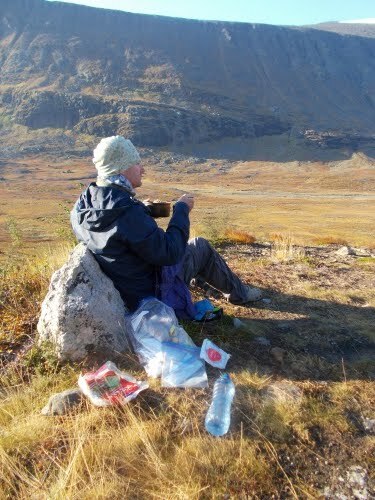 Once we made it back to the Kungsleden, we started keeping an eye open for a good place to camp. The wind was fairly strong, though, and with no trees or large rocks, there wasn't much protection against it from anywhere. 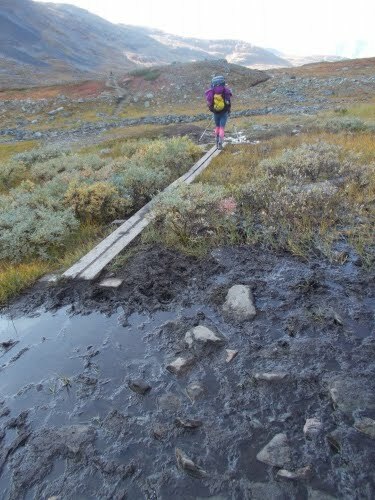 We kept hiking hoping for something better, but Karolina was lagging--still tired and recovering from Kebnekaise. We finally reached a point where there was a river bottom exposed due to the low water level and Karolina liked the idea of camping on it. I was a bit more ambivalent of the idea. It was a pretty location, but the pebbly ground wouldn't hold the stakes for my tarp very well and given the condensation we'd been getting overnight at a dry campsite, I expected a lot of condensation here. I wanted my tarp up! That was my main concern--the tarp. If I were cowboy camping, the site was wonderful. Very leave-no-trace as well. No plants or grasses to crush. 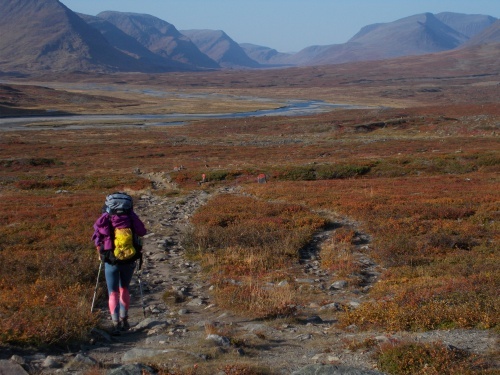 No ugly scar in the dirt of countless other hikers who've camped there before. 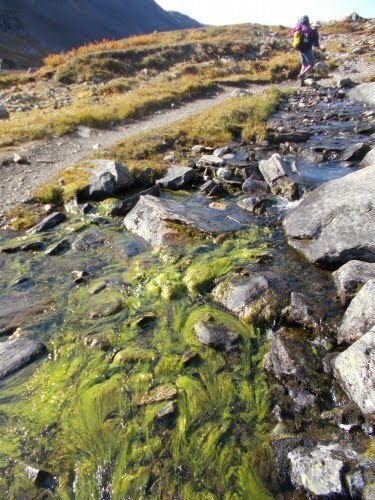 And even if somehow we did manage to leave a trace, the next winter and spring when water levels were higher would completely obliterate any evidence of earlier hikers. We were camped closer to water than is usually advised, but we weren't going to wash dishes or clothes in the water and we could walk away from the river if we needed the restroom. Karolina had another issue, although I'm not sure if she recognized it at the time. 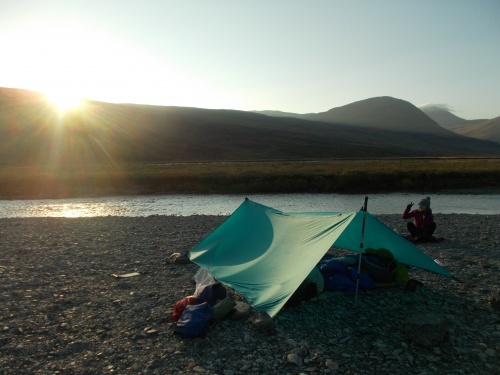 Camping next to a cold river would be a lot colder that camping well away from it at a slightly elevated location. 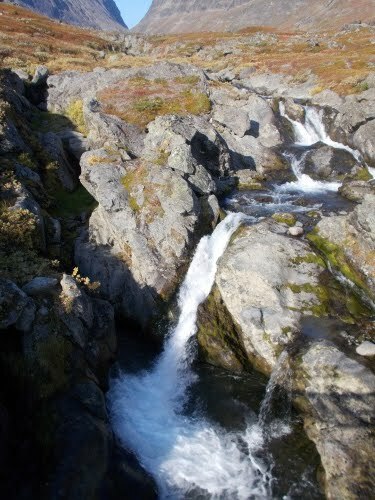 Not only would the cold water chill the air around it, but cold air sinks so there's an invisible second river of cold air following the river downstream for the same reason the river is there. Karolina tends to sleep cold, and I wondered if she recognized that the location she wanted might be very cold after the sun sets. But she was tired and wanted to stop so I agreed. I'd live! I started setting up my tarp and as I expected, the stakes wouldn't stick in the ground on their own. I wound up "mining" large, heavy rocks from a nearby creek bed that I placed on top of the stakes to hold them in the ground. I set up the tarp low as well--the wind was fierce and a smaller profile caused less stress on it. And... eventually, I got it up and somewhat stable. I still worried the wind might pull out a stake during the night, but I'd deal with that problem if I had to. I cooked dinner on the downwind side of my tarp using my tarp as a giant windbreak for my stove--in additional to my regular windbreak for the stove. 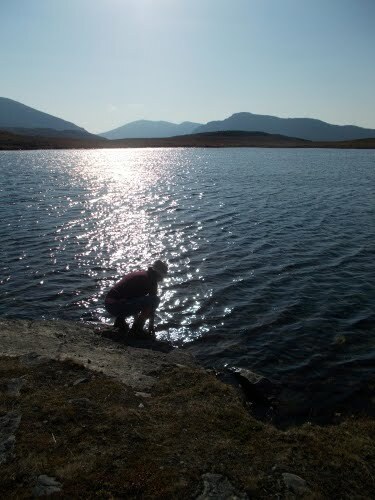 Shortly after sunset, I dived under my tarp and curled up in my sleep bag. It was the end of the another day! 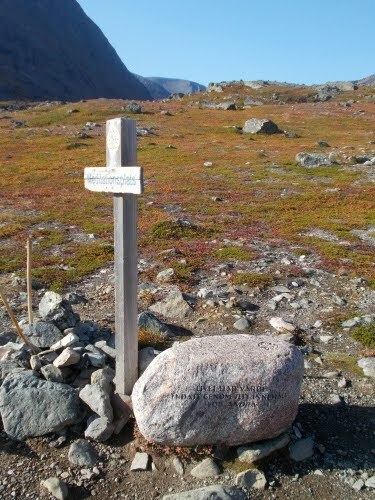 Some sort of memorial on the trail, but it wasn't in English (and I don't think it's even in Swedish), so we had no idea what it was memorializing. 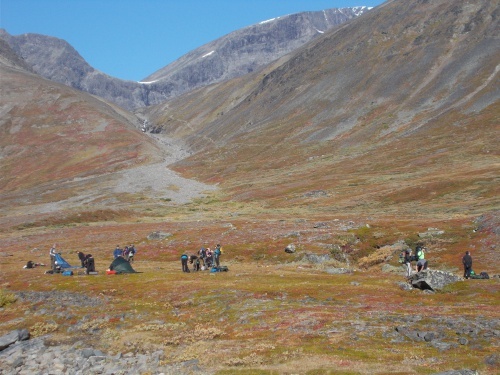 This is the group of students that caused us so much trouble at the last boat crossing a few days earlier, but more interesting... you can see the trail up Kebnekaise in the background of the photo, heading toward that gap in the distance. 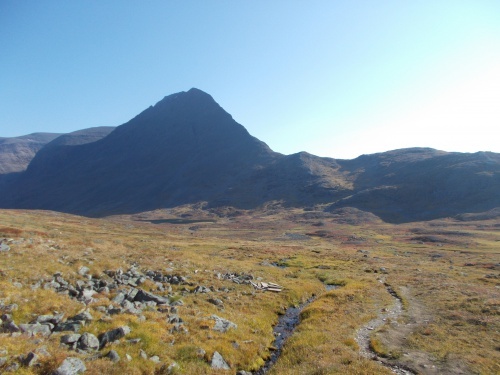 The trail would climb to the very top of the mountain on the left, then descend hundreds of feet into the gap to the right of it before resuming its climb to the summit of Kebnekaise which is the mountain in the distance on the right. The very tippy-top of the mountain, however, was not visible from this point. But you can probably see about 95% of the trail we did yesterday in this one photo! Now there's a muddy section! Karolina admires the view and has an idea... maybe we can camp on that dry riverbed down below? So that's what we did! Notice the wind pushing the tarp in? The wind was quite strong! In another posting, Ryan mentioned about timing. 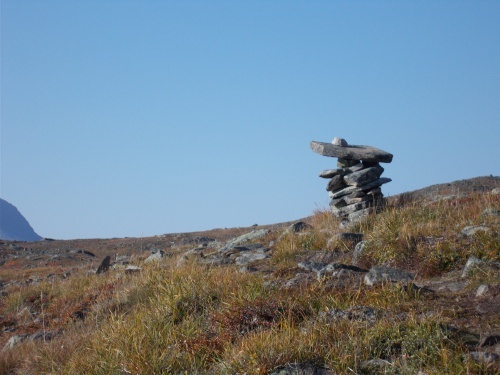 How accurately can you time your hikes? For example, are you trying to keep up a schedule to make sure to catch a flight? 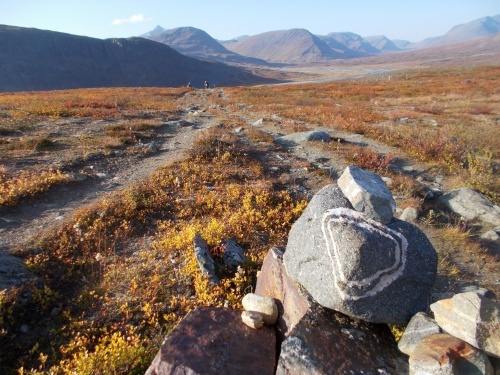 Based on the map (https://goo.gl/maps/xQCYWB4DkmH2), it looks like you are getting near the end of the trail. At this point, do you feel any time pressure? Or perhaps when you reach the end, you'll have to wait around for days for that flight? For the most part, it's pretty easy to time a hike. You know the number of days you have, so you figure out the number of miles per day you have to do to finish on time. Give yourself an extra day or two--just in case. Weather, injuries or whatever can slow you down unexpectedly at the end. 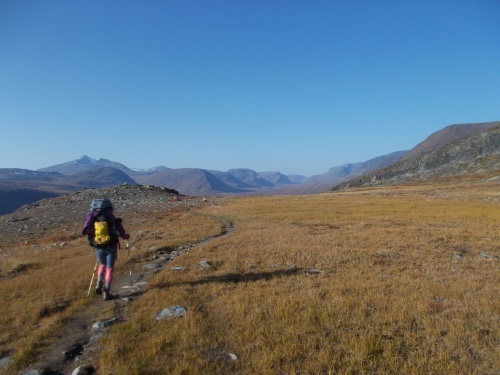 At this point on the trail, we knew we would likely finish at least a few days before our flight and we slowed down dramatically as you'll read about in future posts with more detours and shorter days. We still finished a couple of days earlier, but a couple of days early generally isn't a problem because there's stuff to see and do at the end. Towns to explore, day hikes to consider, museums to check out, etc. I'd rather get to town a couple of days early than a couple of days late, though! When I don't have a specific flight I'm booked for and my finish time is flexible, I just finish whenever I finish. Schedules don't matter so much, although I'll usually have a pretty good idea of the day I'll likely finish a trail a week before I finish it.